Among 32 flavours the chosen one! Always been my most favourite. Apart from them I like Vanilla and Banana. Occasionally Strawberry and Blackcurrant. I wonder what different flavours are there since these ones are the most common on the planet. 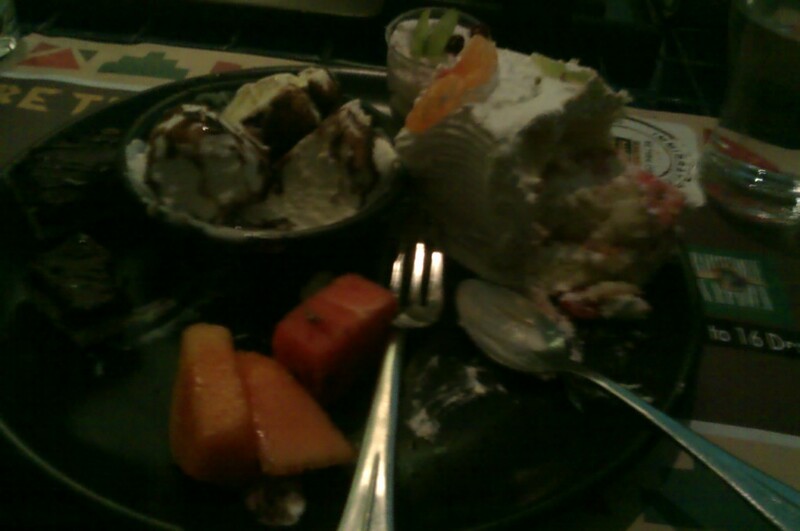 Speaking of ice-cream and desserts, this is (a part of) what I had in December at Barbeque Nation. ‘Dam Awesome’ would be an understatement. This was the first time I took a pic of something which I ate (that too after almost being done) as I find people posting pictures of what they are eating highly annoying. I wanted to give write something about this place so the pic. The food overall was amazing. One of the best restaurants in the Mumbai, be sure to go there at least once (enough to make you go again, mostly) The starters and in this context the desserts were delicious! I’m already growing fat thinking about it, and need to go there again. So anyone wants to treat this poor soul? This entry was posted in Uncategorized and tagged chocolate, flavor, flavour, ice-cream, postaday, restaurant, writing prompts by The Nameless One. Bookmark the permalink.